The VM 20 chamber vacuum packaging machine is well known for its excellent quality and the advanced technological solutions which it offers. The command board on VM 20's vacuum packing machine is electromechanical or digital, with 10 different programmes, each of which can be set independently with different values for vacuum – gas injection – sealing. Each command board has a microchip that monitors the different functions and each VM 20 can be equipped with a sensorial values-control system which allows the user to set percentage values for the different functions: vacuum – gas – sealing. The VM 20’s electronic display indicates the number of working hours to which the machine has been subjected and shows automatically when maintenance is required. The VM 20 vacuum packing machine can also be supplied with the ultravacuum function and is available with different options supplied on demand. 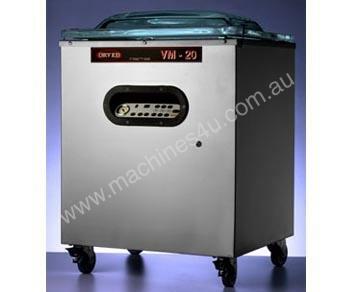 Each VM 20 is EC certified and complies with the strictest of international standards.